The following test is based on a simple application that allows to create a user by delegating this action over an event bus (for more details about this sample application, please feel free to skip to the chapter Appendix : UserService Application using Guava’s Event Bus). The user service triggers the event, and finally the user repository (named UserStore) enables us to fetch existing users and query users by their name. When the first user is created, we’re working with a fixed delay (assuming that 2 seconds are enough to complete the process), for the second user, we’re using the user repository (amount of stored users) as an indicator of progress here. As I’m covering only some basic features here, I’d highly recommend to jump over to the Awaitility User Manual! 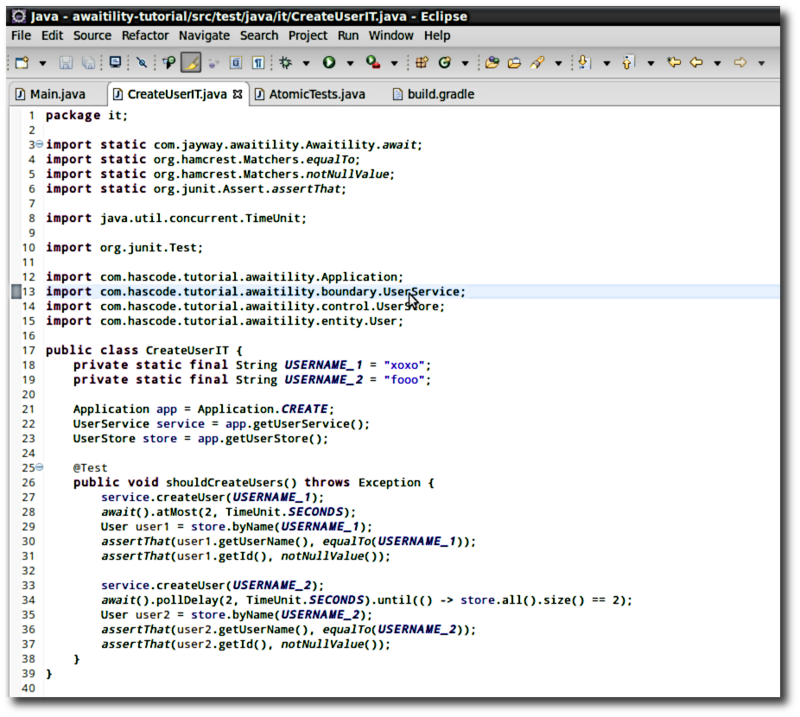 When dealing with Java’s atomics, it’s getting just easier as Awaitility allows us to interact with these types directly. In the first test we’re binding Awaitility toe the state of an AtomicBoolean, in the second we’re waiting for a specific value of an AtomicInteger. This is a small sample application used to demonstrate the usage of Awaitility with this event-based application. This is POJO to encapsulate user information, in addition it contains a factory method to create a new user by his username. On creation, a UUID is generated for the user. This POJO encapsulates the event when a new user should be created. In addition to the user data, a time-stamp is created. The UserStore makes the repository layer to store a concrete user – in our simplified case – in a hashset. Besides storing users the story allows to return all existing users and to find a user by his username. This handler is called using the event-bus when a UserCreateEvent has been triggered. It delegates the user to the user repository aka the user store for persistence. This service is our boundary and entry point for creating users in our sample application. This cheap-shot singleton application simply bootstraps our application by initializing necessary components and setting up the event bus. This entry was posted on Sunday, August 23rd, 2015 at 7:33 pm	and is filed under Java, testing. You can follow any responses to this entry through the RSS 2.0 feed. You can skip to the end and leave a response. Pinging is currently not allowed.